Posted on August 26, 2014 by Jessica Mar. This entry was posted in Staying Healthy and tagged proper desk posture. Bookmark the permalink. I must admit, I have horrible posture. In fact, I’m slouching as I write this article. Sitting at a desk and staring at a computer screen, as I am sure many of us do, really doesn’t help. 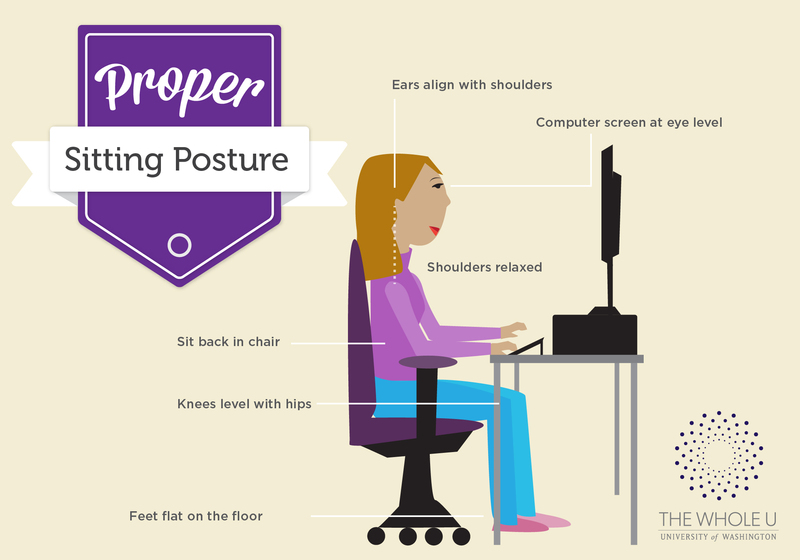 Proper posture helps your muscles to work more efficiently so that they do not become as fatigued. The head is like a bowling ball on a stick (your neck). If the head is constantly forward, such as when you slouch, the weight of gravity has to be countered by muscles in the back of your neck and shoulders, and over time this leads to muscle fatigue and possibly pain. Slouching not only takes a toll on your body, but also on your appearance. “Good posture often makes you appear more confident. In the workplace, slouching can be seen as less professional,” says Dr. Leah Concannon, clinical assistant professor in the Department of Rehabilitation Medicine. So what does good posture look like? There’s much more to it than just sitting up straight. Next time you find yourself leaning over the work desk, sit back, relax, and straighten that back. Remember to take frequent breaks to stretch and change positions. Poor posture is normally formed by bad habits so we’ve got to constantly keep our posture in check to save ourselves from future back and neck aches. Thank you for this article. I wonder if The Whole U would consider providing some office ergonomics support. There used to be people on campus who would come to your workplace and help you properly adjust your workspace. It was very helpful because it is hard to observe our own posture and make the appropriate adjustments. The ergonomics folks also recommended appropriate remedies, e.g., ergonomic keyboards, keyboard trays, etc. I believe the only way to get ergonomic assistance now is to bring in an outside (non-UW) business consultant. How many sick days could we save by reducing physical stress and providing the best possible ergonomics in the workplace? Wouldn’t employee satisfaction also be increased if employees feel more physically comfortable in their workspaces? I’m glad you appreciated the article! In the new year, The Whole U is actually going to be hosting an event with an ergonomics team, so keeps your eyes and ears open for future announcements.